The City of Dunwoody has been working with CEO Michael Thurmond to improve countywide emergency ambulance service by entering into a Memorandum of Understanding with DeKalb County. “My main objective is to get Dunwoody citizens to the hospital on time and to make sure they receive an enhanced level of Emergency Medical Services. I have worked closely with DeKalb County CEO Michael Thurmond to come up with an agreement, and I look forward to presenting it to the City Council,” states Dunwoody Mayor Denis Shortal. • Defined response times: Defined response times for Advance Life Support calls will include a nine-minute or less, 90 percent response time for critical life threating calls and 15 minute or less, 90 percent response time for basic life support calls. • Dedicated ambulances: Two ambulances are already stationed at Fire Stations 18 and 21 in the City of Dunwoody. A third will be posted at Fire Station 12. These units will be dedicated to the service areas of those fire stations which include Dunwoody and parts of Brookhaven, Chamblee and Doraville. The county will also add one additional ambulance unit during the peak hours of 9 a.m. to 9 p.m., Monday-Friday, to meet the needs required by the increased daytime population in the Perimeter Center area. The ambulances serving Dunwoody will be advanced life support units with at least one paramedic onboard. • Technology upgrades: Ambulances stationed in Dunwoody will be equipped with upgraded technology, including: GPS capabilities, radio-frequency identification gate access and traffic signal preemption devices. 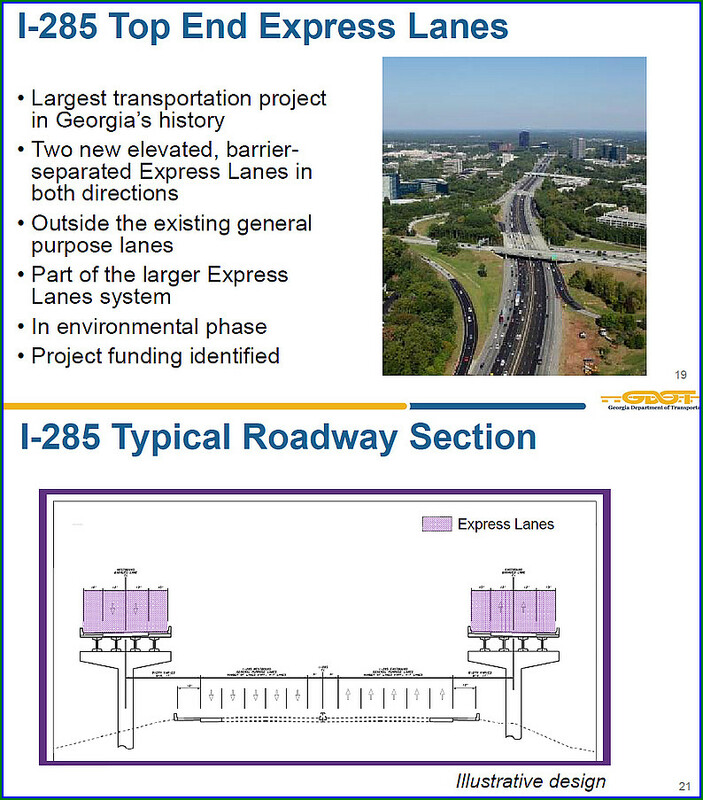 The costs for the upgrades will be shared equally between the City of Dunwoody and DeKalb County. • Greater collaboration: The cities within the DeKalb Municipal Association will have an opportunity to give input and review the county’s 2019 request for proposals for a new ambulance transport contract. • Monthly reporting: DeKalb County will provide monthly reports to the City of Dunwoody that track ambulance response times. The agreement will be effective for a one-year term and will automatically renew until a contract with a new ambulance provider containing the material terms of the agreement is signed. The Dunwoody City Council is scheduled to review and vote on the Memorandum of Understanding at the Monday, November 5th, City Council meeting. The Briers North Subdivision invites you and your children to visit and enjoy the yard decorations, costumes, and trick-or-treating! Candy distribution begins at 6:00pm. NO PETS are allowed. Please don't bring your pet as we hate to have to disappoint you by refusing admission. We close the subdivision to automobile traffic at 5:45pm and it does not reopen until 9:30pm. There is NO parking inside Briers North. If you park outside, please do so legally. Crossroads Church of Dunwoody at the corner of Tilly Mill & Peeler typically allows cars to park in their parking lot. If they do so again this year, please help them with a donation. Please make a donation on-line or at the entrance to help defray the cost! Have fun, and thank you for visiting! 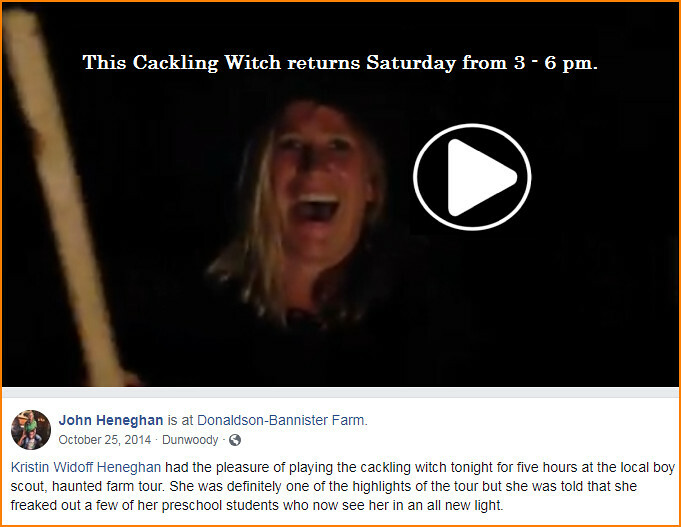 Dunwoody's favorite family friendly Haunted Farm Tour is Saturday from 3 to 9 pm. 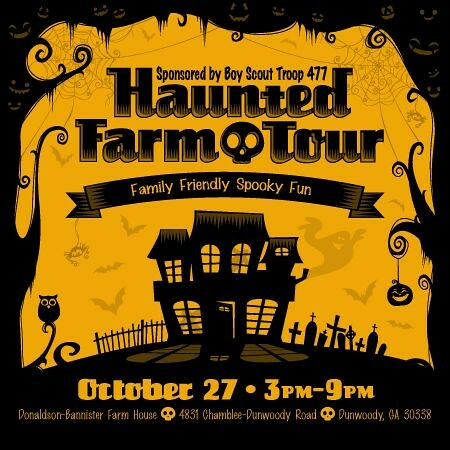 Find spooky surprises and giggles around every corner, as Boy Scout Troop 477 brings Dunwoody’s historic Donaldson-Bannister Farm back to life for Halloween on Saturday, October 27th from 3:00 p.m. to 9:00 p.m. at the newly renovated Donaldson-Bannister Farm (corner of Chamblee-Dunwoody and Vermack Roads). This popular annual event, part of Dunwoody’s Apple Cider Days, will include a “ghost tour” that begins inside the restored farm house and continues through the gardens. Children will be challenged to discover the spell to send the ghosts home. The event also includes a field of games tailor made for kids of all ages, fun crafts and campfire s’mores. You can also enjoy a food court with soft drinks, yummy snacks, hot dogs, hamburgers and turkey legs! Costumes are encouraged. 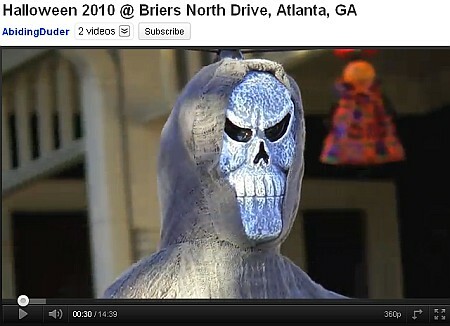 Don’t miss Dunwoody’s favorite Halloween tradition. Hosted by Boy Scout Troop 477, this fun annual event raises money to provide scholarships for boys that couldn’t normally afford to participate in scouting. Plenty of free parking is available at Independence Square (corner of Chamblee Dunwoody at Peeler) with regular shuttle bus service. Additional parking will be available just down the street at the Vermack Swim Tennis center. Boy Scout Troop 477 thanks its sponsors, including Smurti Corp. for supplying the food court. Dunwoody's Saturday morning Farmers Market & evening movie hosted by B98.5 at Brook Run are aimed at Children. Special treats for little one's and will someone please save me a Maple Bacon Donut? I'll be there at 9. Visit the Dunwoody Farmers Market this Saturday, 8:30 a.m. to 12:30 p.m.! 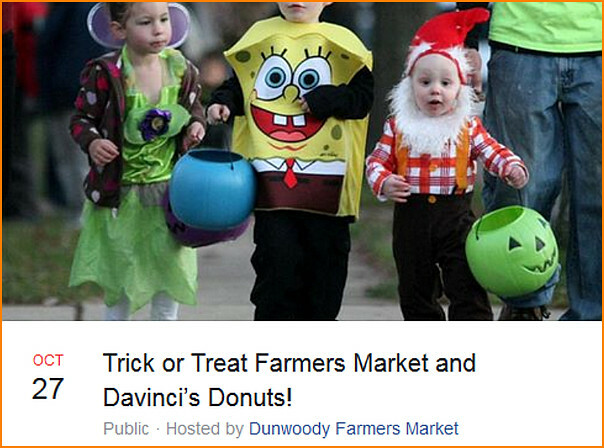 The Dunwoody Farmers Market runs through October at Brook Run Park, 4770 N. Peachtree Road. Enjoy a variety of organic and locally grown produce, veggies, fruit, eggs, grass fed beef, pork, and free range chicken, fresh seafood, organic coffee, honey, jams, relishes, pasta and pesto, breads, gluten-free baked goods, cookies, ice cream, snacks and more! This vibrant farmers market will contribute to the success of local farmers and businesses while serving as a gathering place for the Dunwoody community. With more than 40 vendors signed up for the 2018 season, this is North Atlanta's preeminent market. The City of Dunwoody and B98.5 will host a special Halloween movie Featuring Disney's Coco on Saturday, October 27th at 5:30 p.m. at Brook Run Park (Brook Run Event Field, 4770 N. Peachtree Road, Dunwoody.) The Great Pumpkin, Charlie Brown (Not Rated) will be shown prior to Coco. 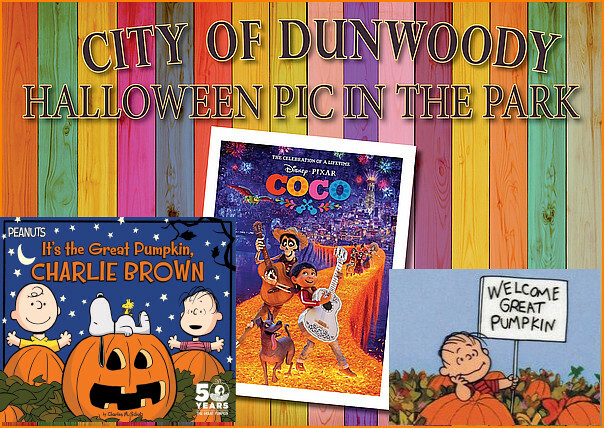 The movie will begin around 7:00 p.m.
Last Dunwoody Food Truck of the Season, Party Band & Costume Contest. Scary Rain is probably staying away - so come join us! 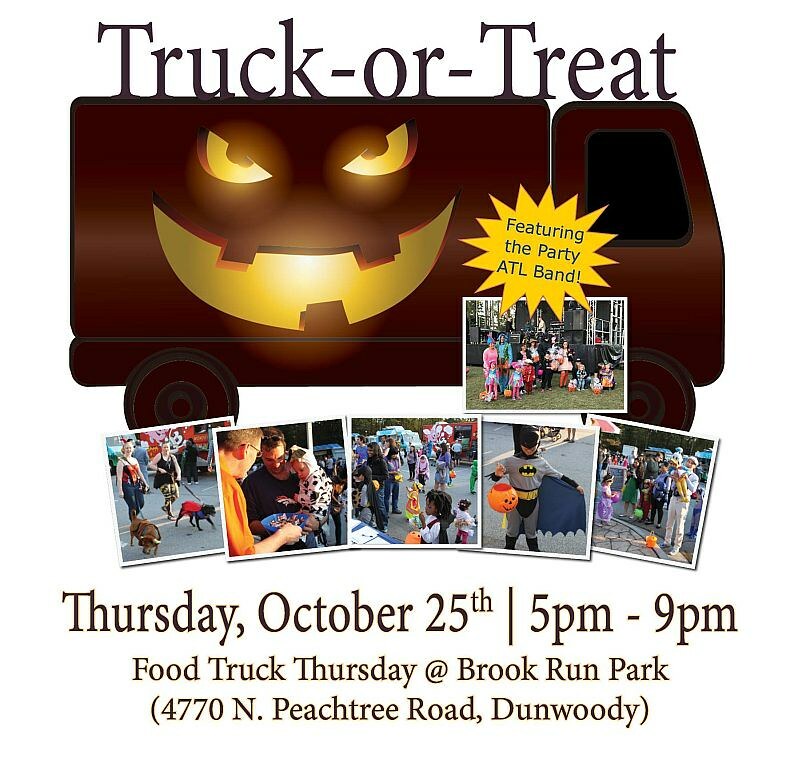 The City of Dunwoody and Dunwoody Homeowners Association are hosting the annual ‘Truck-or-Treat’ event at the last Dunwoody Food Truck Thursday of the year! Come dressed up for Halloween, enjoy dinner and ‘Truck-or-Treating’ at Brook Run Park. The Party ATL Band will also be performing (from 7pm to 9pm) on the lawn beyond the playground. Registration will end promptly at 6:15 p.m. 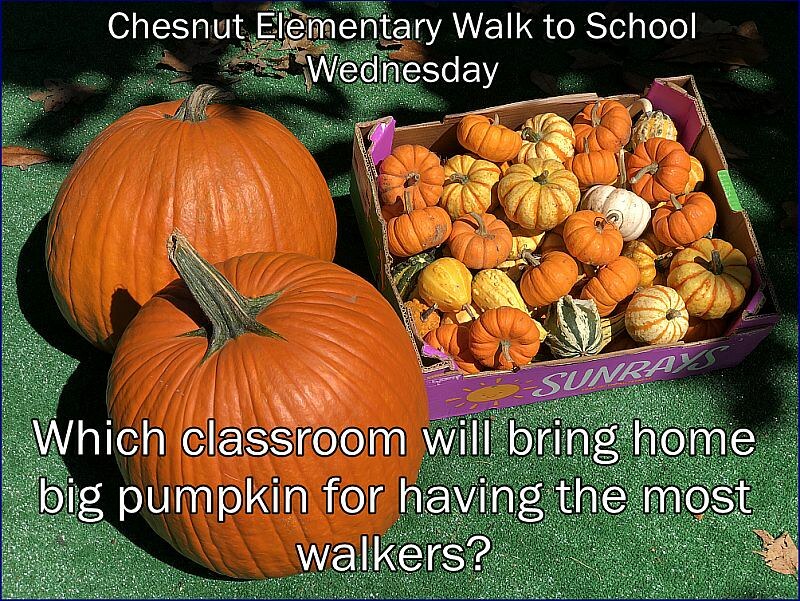 Winner will be announced in the event field beyond the playground at 6:30 p.m. 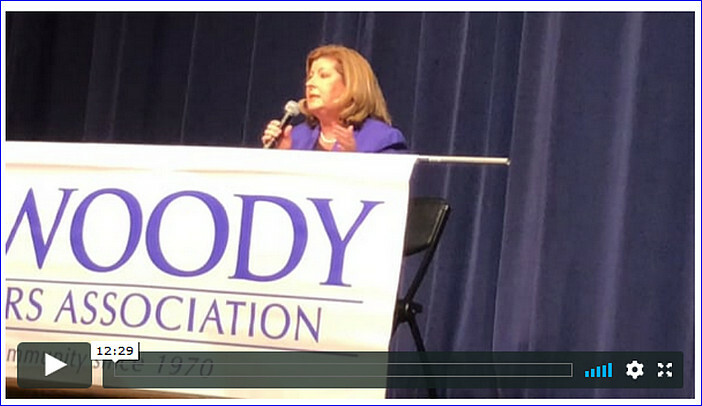 Kudos to the Dunwoody Homeowners Association for hosting the Political Forum on Sunday and a great job by Adrienne Duncan as moderator. 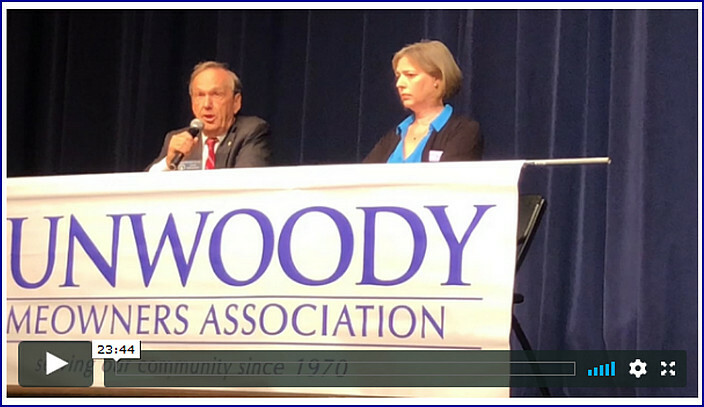 The Dunwoody Homeowners Association welcomes the public to its annual Candidate Forum at the Dunwoody High School Auditorium on Sunday, October 21 at 2 PM. State Senate District 40: State Sen. Fran Millar (R-Dunwoody) and challenger Sally Harrell. Handel challenger, Democrat Lucy McBath, did not confirm her attendance with DHA officials, according to a press release. 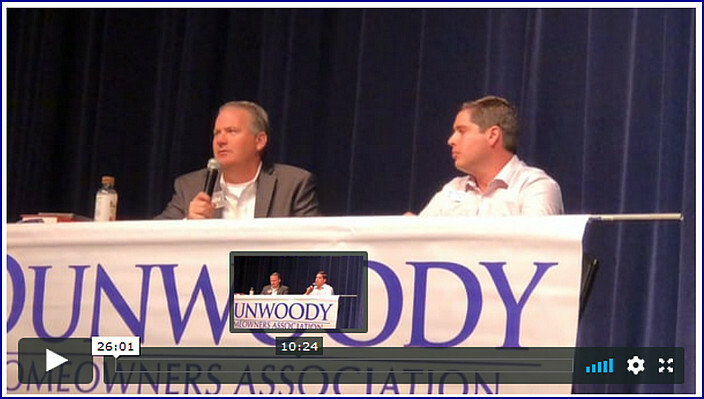 The Dunwoody Homeowners Association is non-partisan and non-biased. The DHA does not endorse any political party or candidate, but promotes an informed public opinion among our diverse citizenry. Final list of participating candidates will be posted closer to the event when their campaigns confirm. Early voting at the Dunwoody Library started October 15th and will run for three weeks. Over 6,000 people have voted at the Dunwoody Library in the last week. Resolution Appointing Members to Serve on Sustainability Committee. 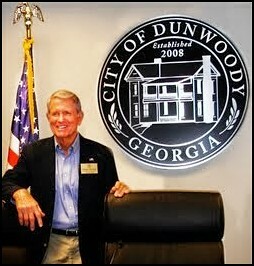 City of Dunwoody Town Hall Meeting with Mayor Denis Shortal - Tuesday October 16th 7:00 p.m. The City is holding a Town Hall Meeting and we want to hear from you! Be an active participant in your local community and share your thoughts, questions and ideas at the City of Dunwoody 2018 Town Hall Meeting. The city is collecting public input on potential topics and issues you'd like to have discussed at the Town hall event. To submit topics and issues of interest, please visit www.connectdunwoody.com and let the city know what you'd like to hear about at the meeting. This is a FREE event and open to the public. 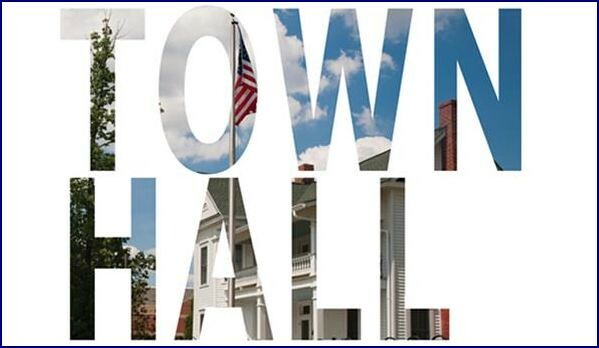 The Town Hall will take place on Tuesday from 7:00 p.m. – 9:00 p.m. at Dunwoody City Hall (Dunwoody Hall – First Floor) 4800 Ashford Dunwoody Road, Dunwoody GA 30338. This is your chance to participate in authentic conversation focused on pertinent community issues and topics selected by you, the participants. The featured speaker will be Dunwoody Mayor Denis Shortal. This same position also looks to be advertised on the parent company website here. Full-Time / Part-Time - This position is responsible for receiving emergency and non-emergency calls for service over the telephone and by other means, employing appropriate call screening protocols, and responding to those calls by dispatching the appropriate public safety resources. This position is responsible for interaction with other public safety dispatch centers in the answering and transferring of calls and incident information, and for maintaining communications with field personnel in law enforcement, fire and EMS agencies. This position is required to respond appropriately to requests for services and information from field personnel. The Telecommunicator will report directly to the Shift Supervisor. Processes incoming and outgoing emergency and non-emergency telephone calls, ensuring agency policy, procedures and goals are met. Dispatches and communicates with law enforcement, fire and EMS units, ensuring agency policy, procedures and goals are met. Provides Supervisor with input regarding policies and procedures pertaining to the operation of the communications center. Coordinates with Supervisor to implement changes in Center procedures. Speaks English clearly and verbally communicates effectively. Works effectively and calmly in a high stress environment. Maintains familiarity with the general geography of the communities served. Meets all training requirements of the Center. Participates in available professional development for center staff. Communicates in a positive manner with Supervisor and other center staff. Reports commendable performance or deficiencies or liability issues to Supervisor in a timely manner. Knowledge of accepted call handling practices for public safety call takers with an emphasis on professionalism and high level of customer service. Familiarity with principles and practices of radio communications as well as the proper policies and procedures used in public safety dispatching with an emphasis on professionalism and high level of customer service. Knowledge of all aspects of operations of a public safety communications center. Communication facilities, equipment and management practices as they pertain to the operation of a public safety communications center. Technology systems utilized by a public safety communications center. Operational needs of public safety responders for law enforcement, fire and EMS. Agency’s geographical service areas and relationship/location of public safety responders. Practical working knowledge in public safety communications. Successfully complete a myriad of training initiatives and certifications for call receiving and dispatching. Learn to operate a variety of technology including contemporary computer, radio and telephone systems. Work independently with minimal supervision. Work in an environment where multiple activities are routinely underway that influence the performance of the duties assigned. Coordinate multiple priorities and competing demands on time and multi-tasking. Simultaneously process information from multiple sources (verbal, text, and video) and keep information clear. Quickly and accurately recall information, specifically names, numbers and details. Make appropriate decisions based on minimal information. Deal with sensitive information in a discreet and professional manner. Follow prescribed rules, regulations and procedures. Recall details and record information/numbers quickly and correctly. Communicate effectively and professionally, both orally and in writing. Work collaboratively and cooperatively with co-workers and personnel from customer agencies. Be able to work in a shift-work environment with variable hours of work and schedule over the course of typical work year. Present ideas and recommendations in a clear and concise manner. Be reliable, and highly dependable in reporting for work on time and as scheduled, on a consistent basis. Be available for overtime as needed. High School Diploma (or equivalent). 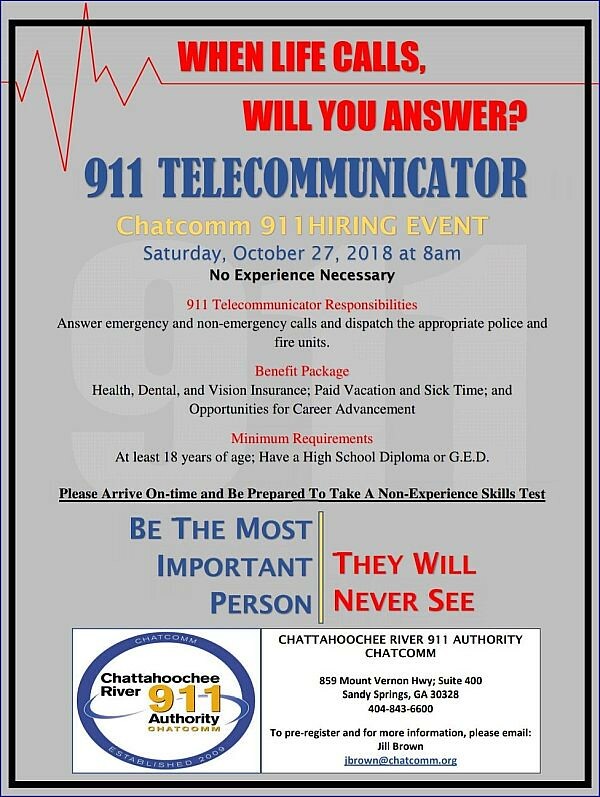 Two (2) years of proven paid experience in public safety communications (preferred). Emergency Medical Dispatch (EMD) Certification through the National Academies of Emergency Dispatch (NAED). Emergency Fire Dispatch (EFD) Certification through the National Academies of Emergency Dispatch (NAED). Emergency Telecommunicator Certification (ETC) through the National Academies of Emergency Dispatch (NAED). General police, fire and EMS operations training. Shift work environment where hours of work will be driven by the call volume demands of the agency rather than convenience of the staff. Breaks and meals scheduled by Supervisors rather than individual desire. Call back and overtime required. 24/7 operations with work scheduled on days others consider holidays. Work performed at a stationary work station. Occasionally will need to handle hostile or abusive callers in a professional manner. Must be able to perform under pressure and in a stressful environment. Dexterity of hands and fingers to operate personal computers. Sitting for extended periods of time working at computer keyboards, monitoring a variety of public safety communications systems, completing documentation required of operations. Vision, specifically to include up close, distance, color and peripheral; depth perception and ability to adjust focus. Hearing and speaking to exchange information with emergency callers and public safety personnel. Stage Door Players invites you to celebrate Dunwoody Arts & Culture month with an evening of music and mingling, headlined by the Tom Woods Jazz Trio. 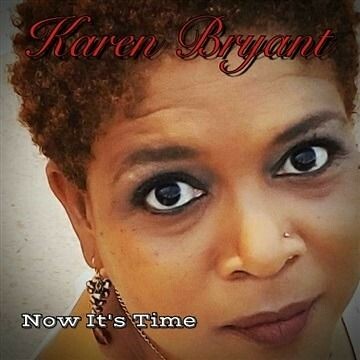 Jazz Pianist and composer Thomas Woods leads the group on keys, along with Justin Owenhead on acoustic bass, Jared Lanham manning the drums & mandolin, and acclaimed jazz songstress Karen Bryant as guest vocalist. The $30 ticket price will get you two beverage tickets, light refreshments, and an evening filled with music from jazz standards to pop tunes and everything in between. Doors open at 7pm on Tuesday, October 16th, for an hour of sips and socialization before the show, and the evening will wrap up with additional reception time to bask in the glow of great jazz. Tickets for the performance are available online at StageDoorPlayers.net or click https://stagedoorplayers.tix.com/Event.aspx?EventCode=1097381 or you may call the box office: 770-396-1726 to make a reservation. Looking for a perfect way to start the evening off, while helping Dunwoody’s own professional theater company? 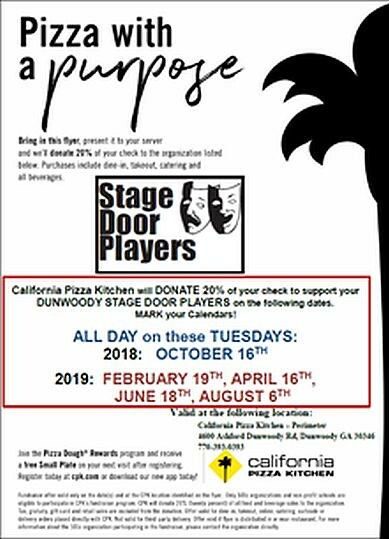 California Pizza Kitchen at Perimeter has partnered with Stage Door Players through their Pizza with a Purpose event - Any item – All Day - October 16th, 20% of your total check will be donated to the theater. Bring this with you or tell your server you are there for the Stage Door Players! 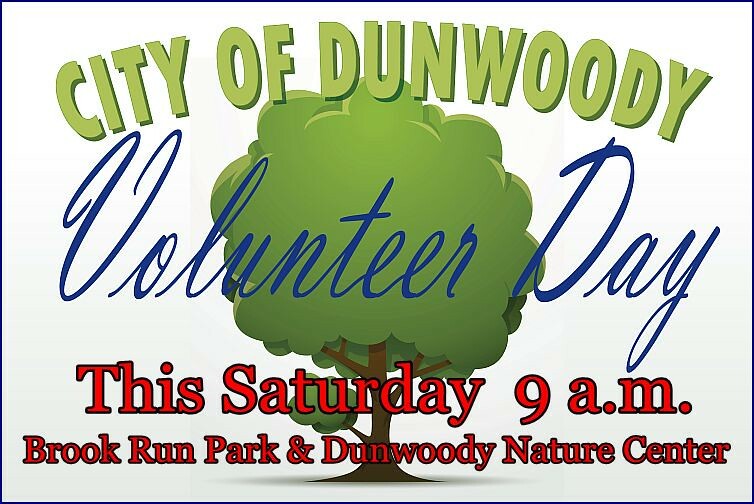 Dunwoody Volunteer Day Saturday, October 13th 9:00 am - please join us. The City of Dunwoody, in cooperation with Trees Atlanta and The Daffodil Project, is hosting a Volunteer Day Saturday, October 13th 9:00 a.m. – noon. Projects include tree plantings at Brook Run Park and Dunwoody Nature Center, daffodil planting at Brook Run Park and along the Dunwoody Trailway, general parks cleanup, and sign cleaning throughout the city. This volunteer event will help plant thousands of daffodils in Brook Run Park in memory of the 1.5 million children who perished in the Holocaust and in support for children suffering in humanitarian crises in the world today. Enjoy local bands, children's area with petting zoo, food court, Moondog Growlers and DHS Academy of Finance business vendors. Bring your historic family photos for scanning and share a memory on video! Classical music (Duo Catanza) and Novo Cucina wine tasting with food pairings at $20 per person. Reservations only at sunsetserenade@novocucina.com or 404-414-7374. Click here for more information. 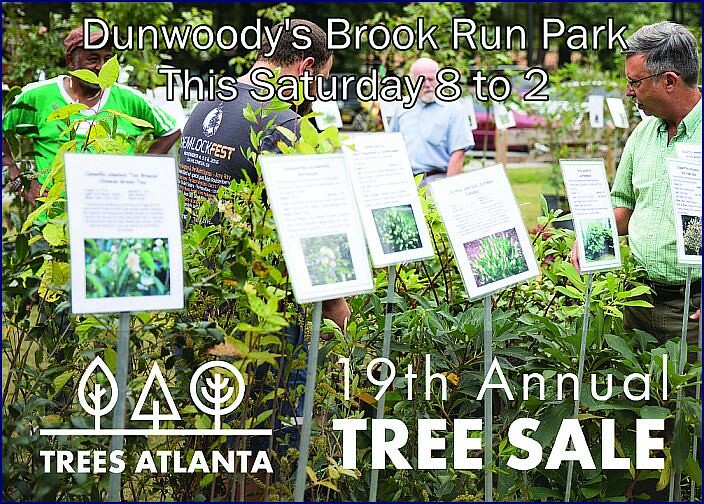 Trees Atlanta is excited to once again be hosting our annual Tree Sale at Brook Run Park in Dunwoody on October 13. We invite everyone looking to add a little shade to their yards to come out and peruse our selection of native understory and overstory trees, just in time for planting season to begin. The sale will feature over 1,000 of the best native and exotic plants available – including more than 100 species of trees, shrubs, native perennials, and tree-friendly vines that provide habitats for our furry and feathered friends. The Trees Atlanta Tree Sale gives shoppers a chance to talk with experts and certified arborist about why each tree is unique, so that making the decision on which tree to buy becomes easier. 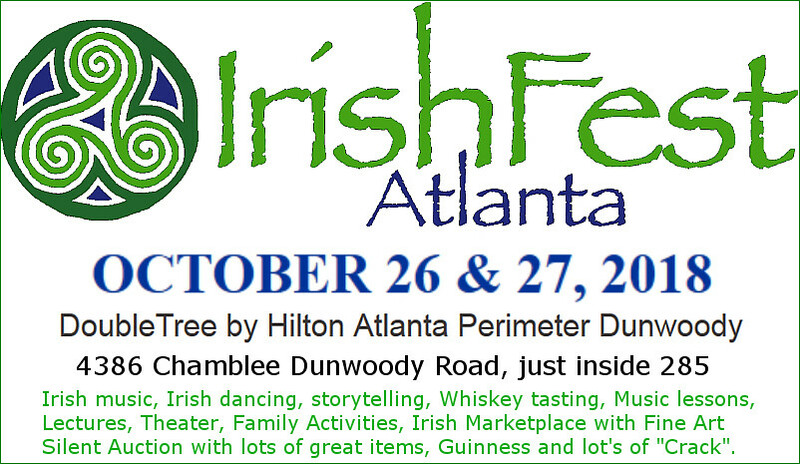 All proceeds benefit Trees Atlanta’s planting and education programs. The trees planted with funds from the annual sale help rejuvenate Atlanta’s tree canopy and contribute to a healthy, diverse forest. Huge Plant List available for preview. The City of Dunwoody proclaimed October 10th, 2018 as Lee Ann Brunson Day. Our school will recognize Lee Ann Brunson Day with a school-wide letter writing activity honoring service members. The students will write letters to honor service members. The service member letter writing activity was always very important to Ms. Brunson. We will participate in The Big Thank You 2018. Please see the link for details http://thebertshow.com/articles/bigthankyou/. Planning Commission starts at 6 pm, Tuesday Night. Grubb Properties is seeking to redevelop a largely underutilized and outdated office park into a vibrant mixed use development. As indicated on the submitted site plan, the owner plans to build four residential buildings with a maximum height of 14 stories and eight townhome units. In total, the residential buildings will contain a maximum of 900 new residential units, all of which will be for sale condo units. Two of the existing office buildings (Buildings 41 and 47), will remain. Along the south portion of the site, one five-story, 92,686 square foot office building (Building 53), will be eventually demolished to make way for a new 19-story office tower, containing up to 500,000 square feet of class A office space. The proposed development will be served by a new east to west primary street connection and a new north to south secondary street connection that will provide internal pedestrian and bicycle connectivity between the office, and residential components. As well, a new secondary street connection is proposed along the northern and eastern side of the lot. The submitted site plan also indicates that the existing streets and frontages along Perimeter Center East will be designed to meet the Perimeter Center Overlay requirements for landscape strips, sidewalks, and street trees. 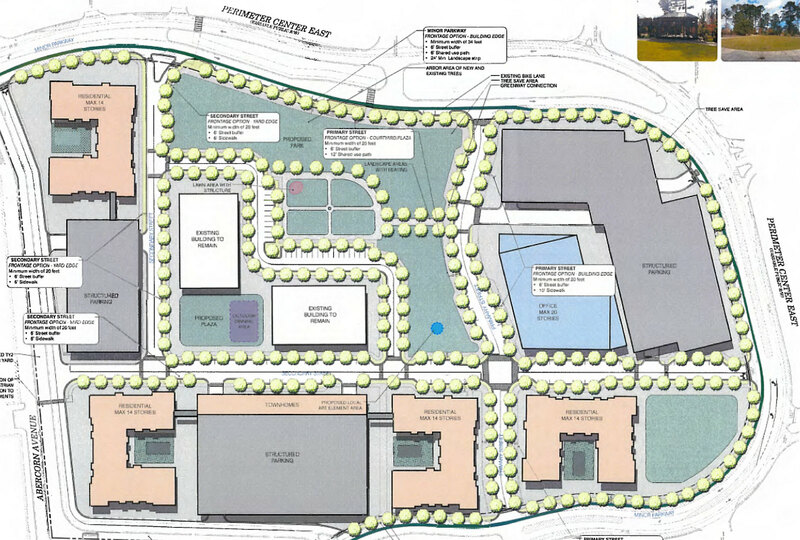 The development also includes more than 2 acres of park space with amenities. The owner has agreed to construct a pedestrian crossing over Perimeter Center East into a newly constructed 12-foot multi-use path that will bisect the subject property, and longer-term could extend to the Perimeter Mall and MARTA. Parking for the development will be shared amongst three parking decks that will not exceed a maximum of five stories. Also, several onstreet parking spaces will be included into the new street designs. Depending on financing availability for the residential units and market conditions, the project will be developed in phases with project build-out estimated to be achieved in approximately 10 years. 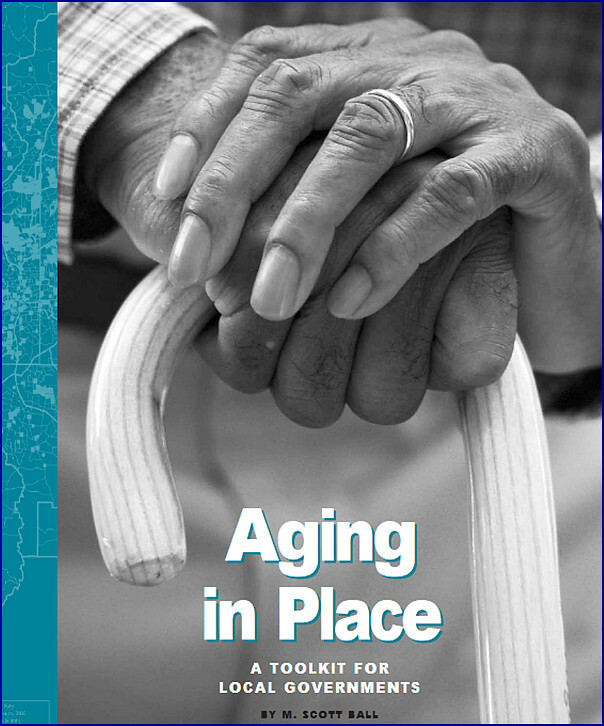 City of Dunwoody needs to ensure we are fostering real estate that allows Aging in Place where possible. 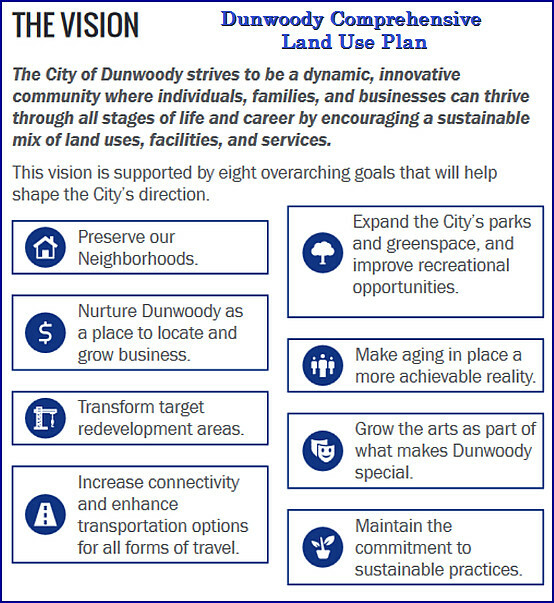 The City of Dunwoody strives to be a dynamic, innovative community where individuals, families, and businesses can thrive through all stages of life and career by encouraging a sustainable mix of land uses, facilities, and services. One of the hot topics in local real estate discussions is finding ways to allow residents to "age in place", by having a mix of housing with various sizes and designs that would serve a wide variety individuals, be it singles, couples, families, but also housing that serves the needs of seniors and those with mobility issues. Dunwoody real estate agents will tell you that the lack of masters on the main and senior friendly housing is a documented problem for those looking to down size from the big four bedroom home with numerous stairs and more landscaping than they can handle. Various housing developments are being proposed but will they hit the mark as being desirable to all walks of life, or will they based on their physical design exclude those who can not handle stairs or long walks to their car? The City recently required a town home developer to offer elevators for those who wanted it because the City wanted to offer a possibility for those buying those units the ability to age in place. 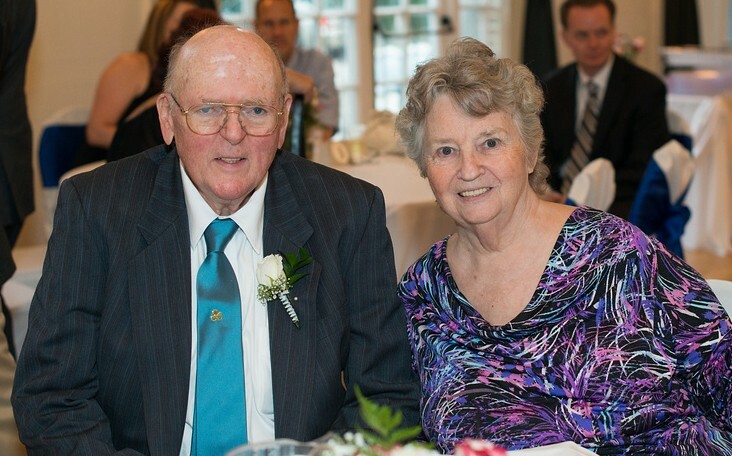 When I think of new housing proposals being offered, I think of my 82 year old parents who's circumstances also mirror many of my neighbors who where the original homeowners of Dunwoody back in the 70's. How would this proposed residential space and the amenities serve the needs of my aging parents and those like them in Dunwoody? My Mother uses a walker to walk short distances and even uses a wheel chair for longer distances. Therefore seeing proposed large scale residential developments, I see my parents, I see my neighbors and ask if this housing product would work for those who want to age in place? As in the case of the proposed town homes, modifications may need to be suggested to improve the possibilities of seniors living there. My parents successfully downsized from a four bedroom single family home to a two bedroom / two bath condo, with a nice balcony, in unit laundry, deeded in building parking below the building, in building storage units, prewired for cable and internet, elevators and a beautiful outdoor gathering place to be social. Luckily, their unit as designed worked well for them without major renovations being needed except we did add in grab bars in the shower and a few other minor modifications. I see this type of condo development that my parents moved into as a viable option for those seniors who are looking to stay close to family & friends yet downsize to single level living. 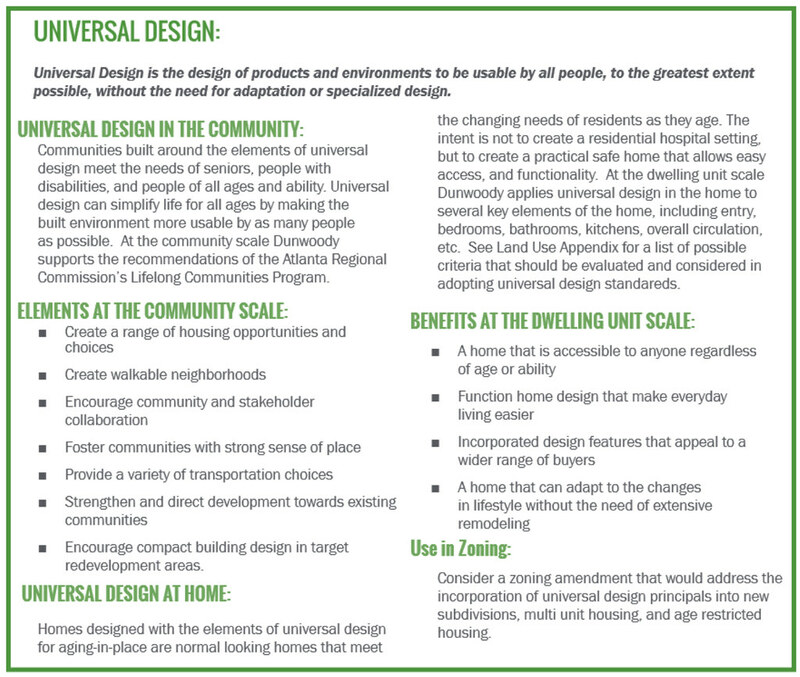 Here is a recognized Aging-In-Place Design Checklist for residential units to keep in mind and as we approve new residential units in Dunwoody we should include the practices of Universal Design to foster aging in place. Not putting these common sense practices into place would be short sighted and detrimental to the entire community. City of Dunwoody Code Enforcement to give an update to the City Council on Monday. The Code Compliance Division receives complaints from citizens reporting violations of the noise, zoning, and land development ordinances such as tall grass and residential parking restrictions. All issues involving criminal activity should be directed to the Police Department , at 678-382-6900. For issues that may result in immediate harm to yourself, others, or property, please dial 9-1-1 immediately. Please Note: the City of Dunwoody does not oversee sanitation services. Please contact DeKalb County Sanitation Services regarding residential or commercial sanitation services. To report a code compliance issue, please email compliance@dunwoodyga.gov or call 678-382-6890. Please keep in mind that all complaints are public record and subject to the Georgia Open Records Act . Persons reporting a concern are not required to provide their name or contact information unless they wish to be contacted by our compliance official for follow-up information. 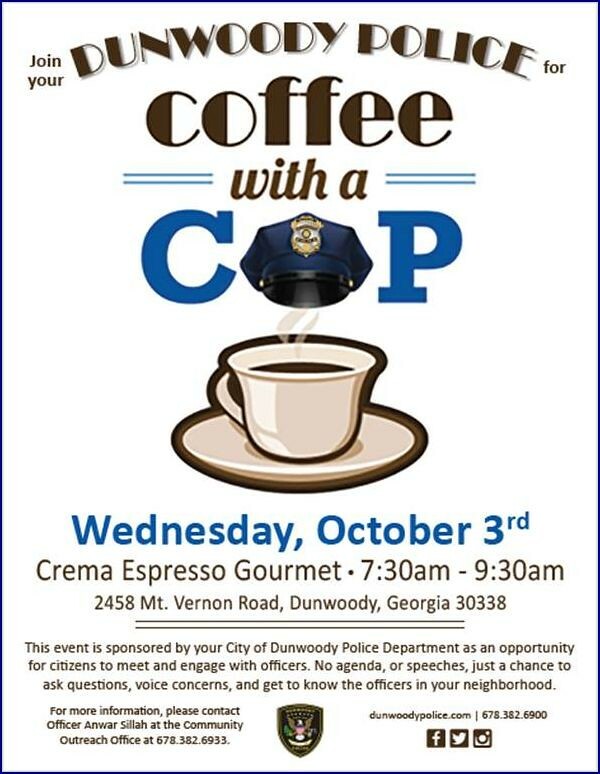 Meet the Dunwoody Police for Coffee at Crema on Wednesday morning. The first Wednesday of every October is deemed National Coffee with a Cop Day. This is the third annual National Coffee with a Cop Day hosted by police departments in all 50 states. Please join your neighbors and Dunwoody Police officers for coffee and conversation on Wednesday, October 3, 2018 from 7:30 a.m. to 9:30 a.m. at Crema Espresso Gourmet. No agenda or speeches, just a chance to ask questions, voice concerns, and get to know the officers in your neighborhood.